Present your best friend with a personalized gift that is sure to be used every day. A Personalized Writing Set is an inexpensive gift with an expensive feel. Each Rosewood Personalized Pen Set makes a unique gift for him or her. 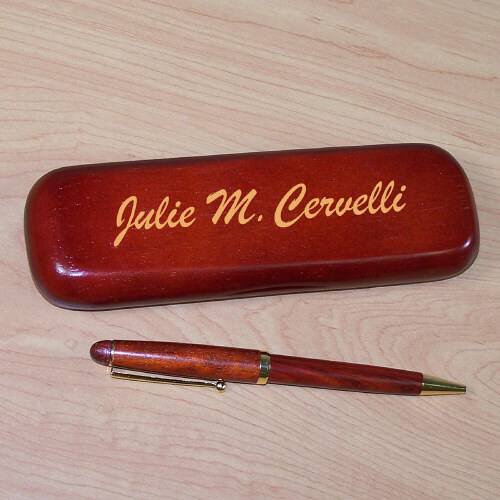 Personalized Pen Set for any one is presented with a matching rosewood case for convenient storage and a beautiful gift presentation. Pen measures 6" in length, black ink and features twist action ballpoint operation. The pen can be refilled with a standard Parker refill. The Pen Case is personalized with any name. Please choose block or script writing. This was a gift I ordered for a graduation. It is a beautiful gift, and it was very popular with the recipient. GiftsForYouNow.com has many additional Personalized Housewarming Gifts for your family & best friends. We specialize in attractive Personalized Picture Frames, Personalized Wall Signs plus much more.